Thankfully I don't get much spam. Blogger and Gmail do a great job of filtering it for me. From time to time I like to take a little peek in to the spam folders and see how many people are eager to give me love, money and drugs. So many people. I could be so rich. So medicated. So in love. But alas. Gmail keeps us apart. However, Blogger has let a few slip by this past week. A few too weird and crazy to just delete. Screenshots were in order before they were sent to the trash. B. It only takes one little hacking to know better than to get too trusty. Is this the weirdest story ever? EVER??? More nonsensical than the ones my first grader writes while trying to incorporate as many spelling words as possible into her nonsense. But strangely charming, is it not? Did a computer write it? To make it sound like a human wrote it? That face amaze the stadium! All because of a purse. 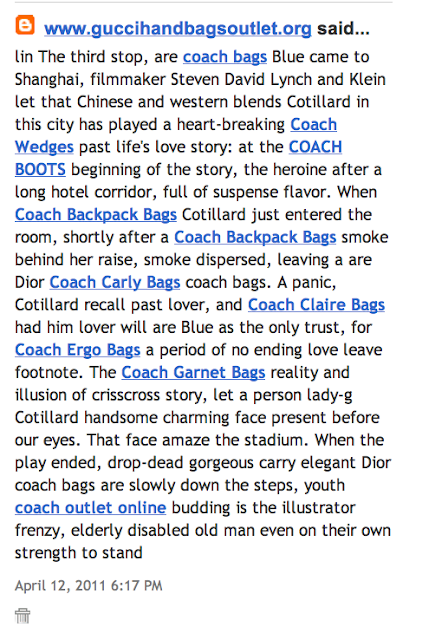 Never underestimate the magical powers of a Coach bag. 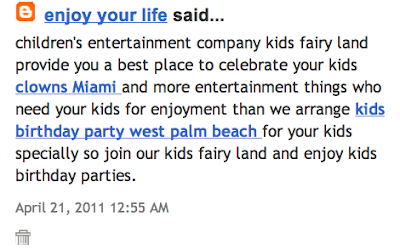 If only I lived in West Palm Beach, my kids could be in a fairy land with celebrating and enjoyment and entertainment things!!! Too bad I am on the wrong coast. Thanks for the oddities spam bots. Got any links to solve my laundry problem? on a totally different topic - i'm so bummed i missed you @ the stirring on saturday. kirsten said she bumped in to you two. kirsten and i work on same team at rockharbor. 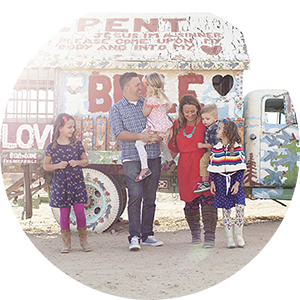 she had asked me about my blog and samuel which is when i started sharing about your blog and how your sweet joy has touched my heart - and she shared that she used to work with your hubby. anyways - hope you're doing good! praying for you and your sweet baby boy growing in your tummy! Lady G Cotillard sounds like a hottie! Crying, Julie. CYING. Andrea is right. You do blog about the best stuff. Definitely had the first comment on my blog too! The funny thing was, the comment was left about 7 times on one blog post calling out all lurkers to leave their blog so I could return the stalking. Made it more funny to me! can someone help the "frenzy, elderly disabled man."? i am concerned. You never fail to make me smile. Hilarious. Hope your pregnancy is going well. I think of you often as you have often provided inspiration, creativity, and humor for me. That Coach bag story kinda reminds me of Engrish. It's where people from other nations try to write in English, but mess up the writing due to the differences in the language. 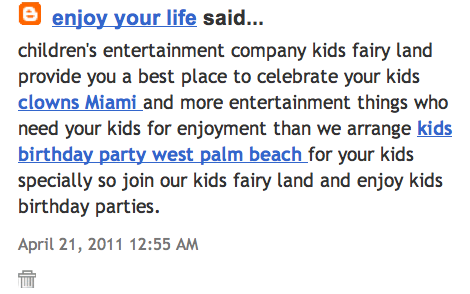 Engrish.com has some funny examples of it! oh honey this made me laugh til rolling. Bahahahahaha! Clowns Miami... creepy and hilarious! I just have to say I am often perplexed by some of the spam comments that come to my blog as well. They usually are filtered out, but I will go over and check every once in a while too. I think What????? Does does these crazy things. I have really only received on spam comment on my blog, but now I'm curious as to see if theres a spam comment section on blogger that I'm not aware of. craziness! Ive never gotton a comment but I have seen a link in my stats that went to a handbag place....so weird!! Congrats on winning that cute rainbow hoodie! How cute will your girls look in that! Very very strange stuff! Had him lover will are blue as the only trust. ??????? And the clowns? They are mocking you! The best to me: Full of suspense flavor. Oh my gosh! I must admit though Im a little relieved. Since no one ever talks about their spam mail I guess I figured I was the only one who gets weird junk like this. You wouldnt imagine the stuff I get because of my blog name. UGH. FYI: I hate clowns too. And since my hubby is a "balloon artist" when hes not teaching or coaching, people refer to him as a clown. Um no, people. Clowns are evil. Hubby is a handsome, non scary "balloon a-r-t-i-s-t!" your comments about the spam bot's comments had me laughing so hard my children were asking if I was crying. thanks for posting those, haven't had the pleasure of anything like that on my own blog yet. :-) you're a lucky gal. I can not even finish reading this post because I'm laughing and crying here at my desk at work - people might think i've completely lost it. I normally don't mind - but how do I explain how hilarious this is. HI-LA-RI-OUS!!! i almost peed my pants reading this, julie!!! my husband asked me to read it to him, and i couldn't get through it because i was laughing so hard. apparently, the humor doesn't translate through giggles because he didn't think it was funny. i, however, am still laughing! Haha! I got the clown one too - random! Ditto what Mel said. I got it too. Clowns Miami or bust! you are hilarious. seriously hilarious!